In a game of 32 penalties, six yellow cards and torrential rain, Preston Grasshoppers threw away a healthy lead to slip to their seventh defeat of the season by fewer than six points. Having built a 14-point cushion in the first quarter, they failed to kick on and saw Wharfedale inflict another agonising defeat as both sides struggled for fluency in a stop-start affair. Head coach Paul Arnold, who left himself on the bench, said: “The lads put in a really good shift, but this was one that got away. Hoppers started well and put the first points on the board after just six minutes, James Gough driving over after Matt Lamprey had picked up from a five-metre scrum. Tom Davidson converted but missed a long-range penalty – the fourth awarded against Wharfedale in under 10 minutes. They conceded another for obstruction after a Preston kick-through but, although that position came to naught, the hosts soon had their second score, Ryan Carlson being on had to crash over after Lamprey was stopped short of the line. Davidson again converted and all looked set fair for Hoppers when visiting prop Toms (correct) Asseyevs was sent to the sinbin. But they could not capitalise and, on the stroke of half-time James Gough, a constant thorn in Wharfedale’s side at the breakdown, overplayed his hand and was also shown a yellow card. The visitors had been penalised 10 times to Hoppers’ eight in the first half, but thereafter the tide turned and the second-half count was a bruising 10-4 against the hosts. then there was an extraordinary incident soon after, Wharfedale got their first try when Sam Gaudie found the blindside completely unprotected to claim an unconverted try. In a scuffle which followed, Hoppers’ Scott Jordan and the Dalesmen’s No 8 Josh Burridge were both sinbinned. On 65 minutes, Wharfedale’s vociferous travelling support went into overdrive when Nathan Pope’s attempted chip on halfway fell straight into the hands of full-back Harry Bullough who raced over unchallenged. Blakeney-Edwards landed a fine conversion to put his side ahead for the first time with 15 minutes left. 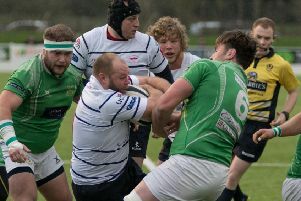 That was time enough for Mr Mabon to issue his sixth yellow card – to home flanker Ryan Carlson – and for Hoppers to lift a long siege and win a penalty just inside Wharfedale’s half. The hosts opted to go for goal rather than a line-out in the corner and Davidson’s effort fell short to end a frustrating afternoon.